Many women experience dark discoloration under their eyes at some point or other. This is known as dark circles, shadows or under eye bags. There are different causes for this condition. It can sometimes be due to the lack of sleep, aging, excess fluids, long hours of work at a computer, dry skin, extended crying, salty diet or stress. It affects both men and women of varying age levels. It is really not a big deal for men, but women make it a huge deal because it makes them look fatigued, aged and exhausted. That is the bad news. 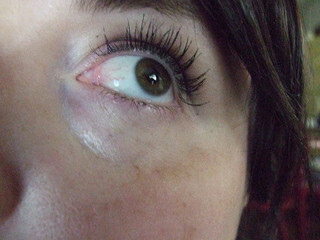 The good news is that you can eliminate those dark under circles with simple and natural remedies. Lemon juice is filled with Vitamin C and contains skin lightening properties, which is a great recipe for removing those dark under eye circles. So here is what you do: Take a cotton ball and squeeze lemon juice on it. Apply it around the contours of your eyes. Let it sit there for roughly ten minutes and then rinse off. You should do this for several weeks. You can also make a paste with the lemon juice by adding flour, and mashed tomato and turmeric powder. Gently apply the paste under the eye. Leave on for up to fifteen minutes and then wash it off. Do this about three times each week. If your skin is sensitive and you experience any type of burning sensation, you should not continue. Nothing is soothing like a good cold compress for the eyes. If you don’t have a cold compress, then you can fill a plastic bag with some ice cubes or use the bag of frozen veggies you find in your freezer. Let the cold compress sit on your eyes for about twenty minutes while lying down. This will definitely diminish any swelling. I am sure you probably heard about green tea bags. After being dampened with cold water and squeezed with the fingers to let out the moisture, you put them over your eyes for roughly fifteen minutes. The green tea contains an ingredient called tannin, which temporarily helps to reduce the swelling under the eyes. Use your makeup concealer to get rid of under eye bags, even though it is a temporary solution. It is one of the fastest methods to see results. Choose a concealer that matches the color of your skin. If you have darker under eye bags, use a lighter shade of concealer. It is best to use a cotton ball to apply the concealer, but you can still use your finger gently. After applying the concealer, add some matte powder so the concealer can stay in place all day. Change your sleeping position. Instead of sleeping on your stomach, sleep on your back or your side. It could make a difference in waking up without those under eye bags. When you lay on your stomach, it can cause your eyes to collect fluid during the night. Under eye bags are not attractive for a woman and she doesn’t want to lose her fabulousness. So, try one or more of these solutions and you will be looking like the woman you want to be. Let us know how it worked for you by leaving your comments below.